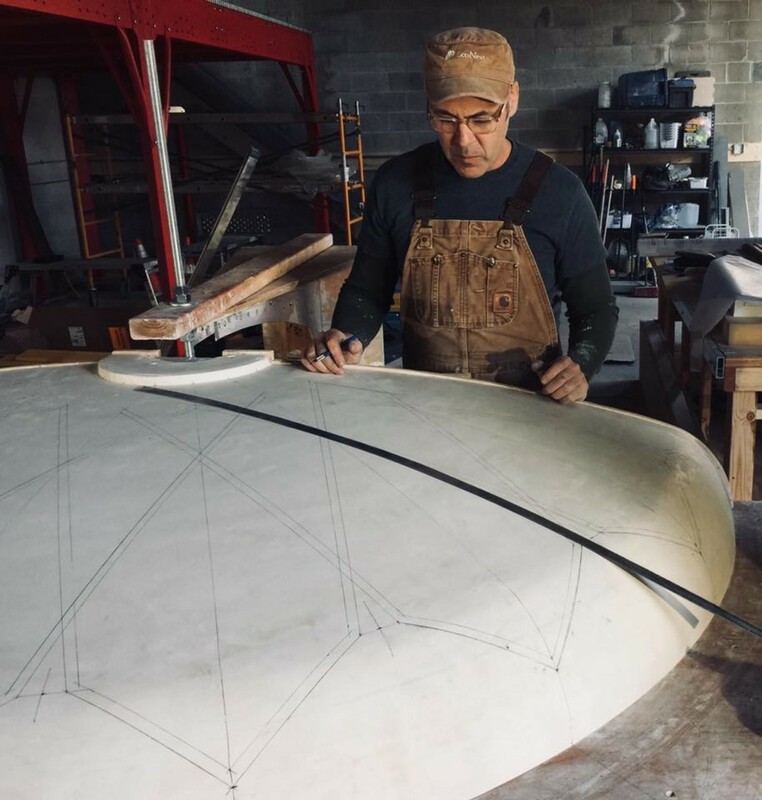 Last autumn, I was passing through the Shenandoah Valley of Virginia and decided to drop in on a good friend of mine, traditional timber framer Jordan Finch. Jordan and I had taught together at the American College of the Building Arts in Charleston, SC. 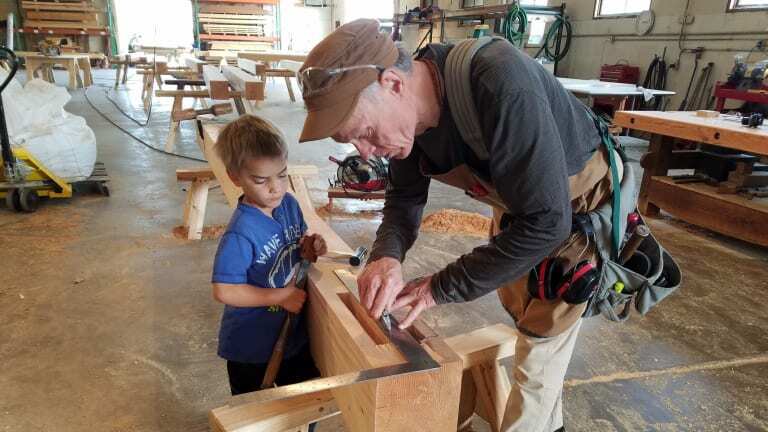 When I arrived, he was busy hand chiseling and fitting the mortise and tenon timber joints for a project with fellow timber framer Robert Laporte. Robert and his wife Paula have a company EcoNest that specialises in design-build of homes, traditionally timber framed with light clay straw infill, that are typically lime plastered inside and out. I gave them a hand for a day and ultimately Robert recommended me to the homeowners for the plasterwork. The whole process was fascinating and I&apos;ll endeavour to share from this experience the type of home that is today possible by the combination of highly skilled means and methods of traditional craft with the truly sustainable ethic of a contemporary natural building approach. You can&apos;t get more sustainable than responsibly cultivated and harvested timber. A properly constructed and maintained timber frame structure can endure for centuries. 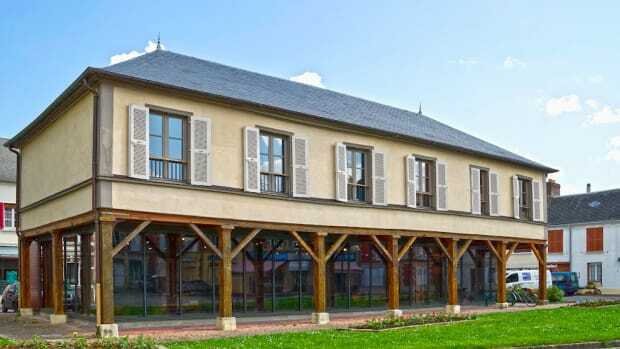 Timber framers are really architects in the original sense of the term, master (arkhi-) craftsman (tekton), who design and undertake the construction of the primary structure that holds the building up. The next generation of Finches was in on the action as well. Apprenticeship can&apos;t start too early on the long road to mastery! 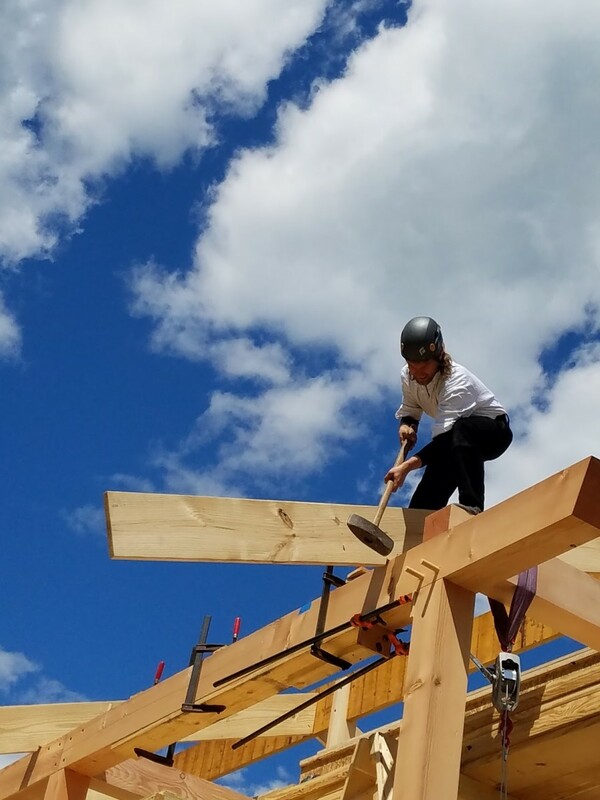 A benefit of timber framing is that almost all of the construction of the members can be carried out in shop conditions and brought to the job site for a rapid assembly. Lincoln logs for grownups! The next phase of the project was to shutter and infill the timber framing with light clay straw. Light clay straw is a contemporary adaptation of some very ancient traditional wall assemblies: cob and rammed earth. Similar to cob the mix is a combination of loam (sand and clay) and perhaps a bit more straw or other woody fibres. That cob-like mix is then stuffed and lightly tamped between form not unlike rammed earth but not quite as dense. 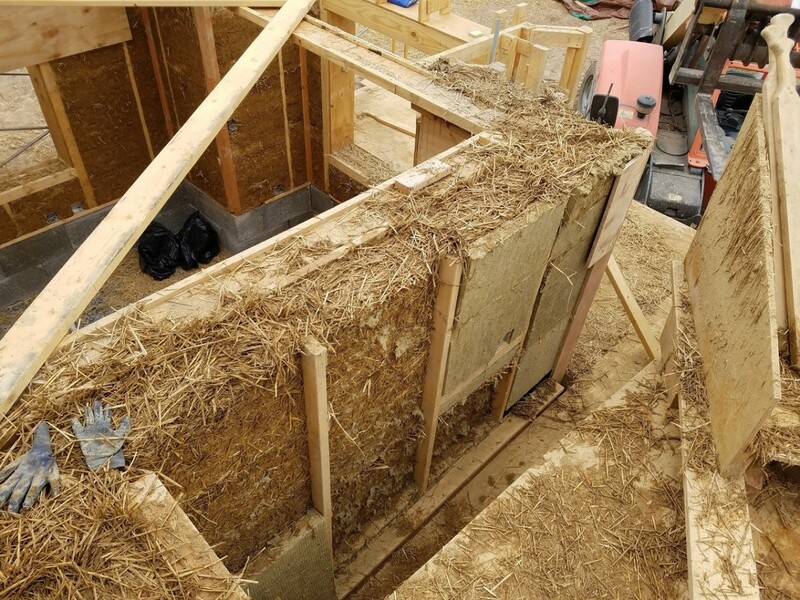 The thermal mass of the loam and the thermal insulation of the straw make for a very interesting "dynamic insulation" that can contribute significantly to a very comfortable indoor environment in a variety of climate conditions with a minimum of energy consumption. A similar approach was used for most of the earthen floors which utilised a mix richer of clay, finer fibres and finished with linseed oil. 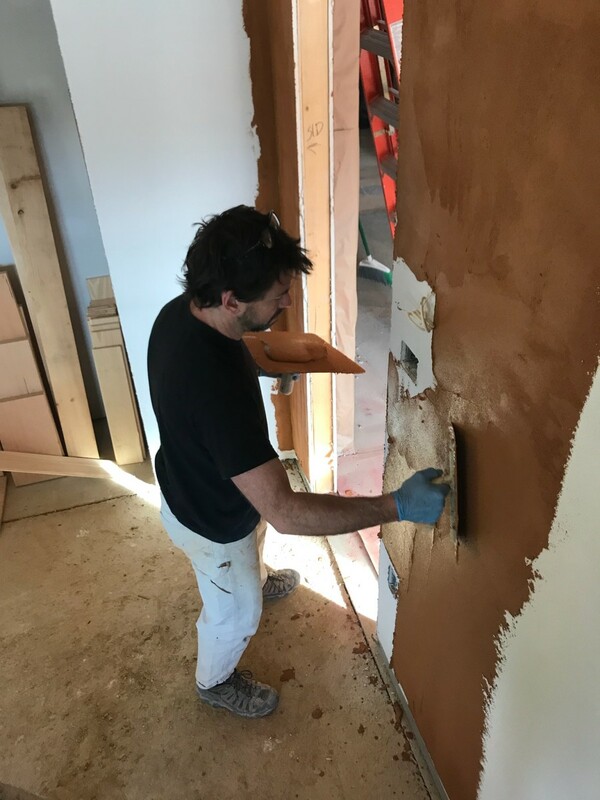 Next up: loads of plastering with another good friend, Rob Wozniak and his team from Preservation Works! For the interior perimeter walls, we installed lath followed by removable wooden grounds that we used for scratched render followed by applying and leveling the brown coat with rods and compressing with wooden floats the following day. The plaster mix was a combination of two local sands, hemp fibres for tensile strength and Lafarge Natural Hydraulic Lime as the binder. 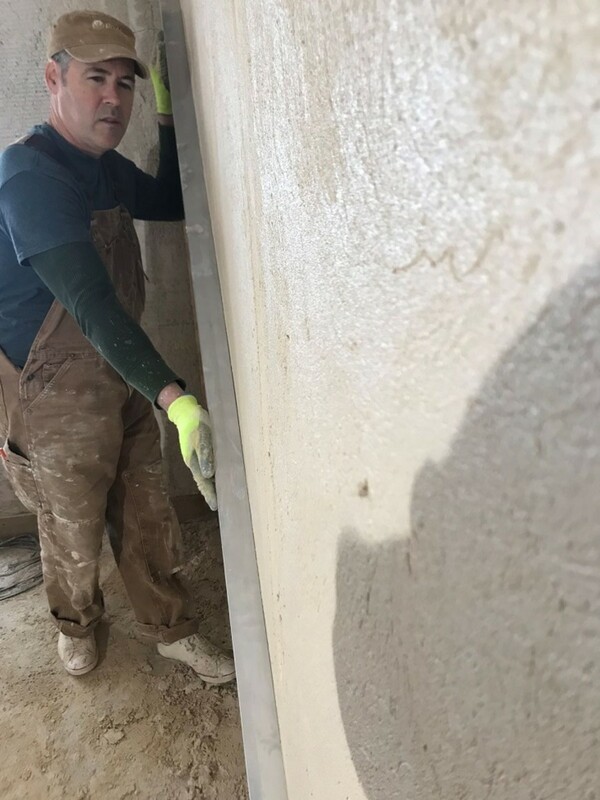 The first week all of the preparation and scratch render went up and with the hydraulic properties of the lime setting in we were in good shape for the next float coat and clean up by week two. Lime plasters were the perfect choice as they are exceedingly durable and share the moisture permeability of the light clay straw substrate. The exterior lime mix and application was basically the same as for the interior; sand, hemp fibre and hydraulic lime applied in a scratch and brown coat. 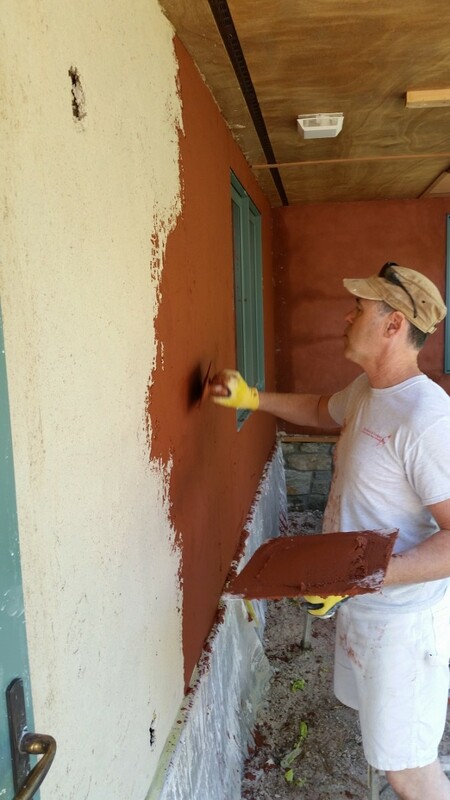 However, instead of finishing with clay, the final coats were of lime stucco as well pigmented with mineral tints. The traditional design principle of "having a proper hat and a good pair of boots before going out in the weather" was followed here. 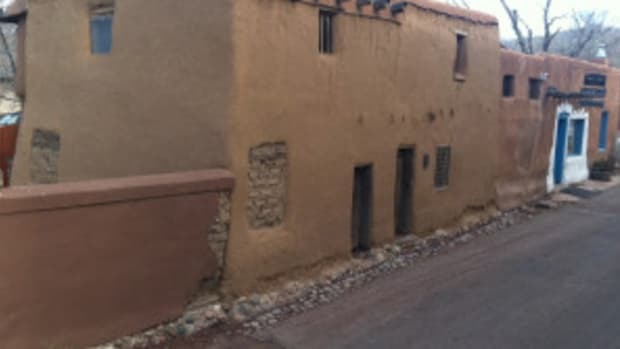 There was an impermeable stone water table up to two feet to prevent rising damp or back splashing as well as extended eaves to prevent the possibility of streaming water that might erode or discolour the stucco finish. Very smart application of embedded traditional wisdom as this part of the country can have some brutal winter and spring weather including blizzards, ice, sleet and heavy rains. The hexadecagram pattern could now be adapted for the determined surface. This was all carried out traditionally, geometrically with compass and rule. The initially provided design was modified, the proportions of the &apos;safts&apos; or petals of the star-like tessellation were adjusted to produce a more harmonious composition and the entire pattern was reduced in scale so as to be fully observable from a prostrate position on the ground. 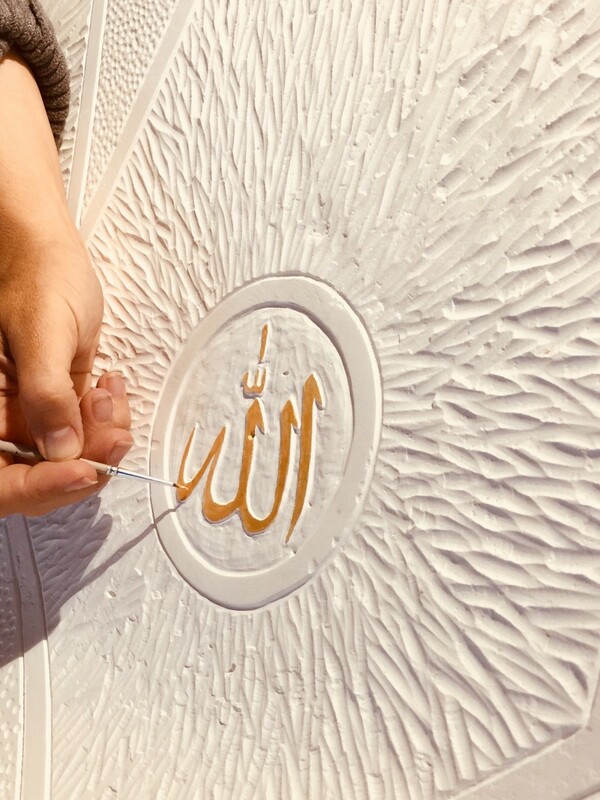 A calligraphic element, "ﷲ, Allah" was placed in the direction of Mecca to provide orientation for prayer. Translating the interlaced pattern from a scaled two-dimensional drawing to the three-dimensional surface of the dome was another important step involving more geometry. The dome was to be cast; this meant that the "void" had to be first extruded in plaster. Onto that inverted surface the pattern was carefully and methodically transferred, physically inscribed utilising several methods to verify its precision. 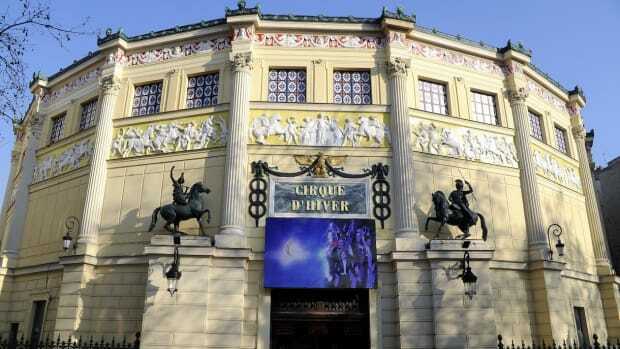 This accomplished, the casting of the dome in a relatively thin shell of plaster could commence. 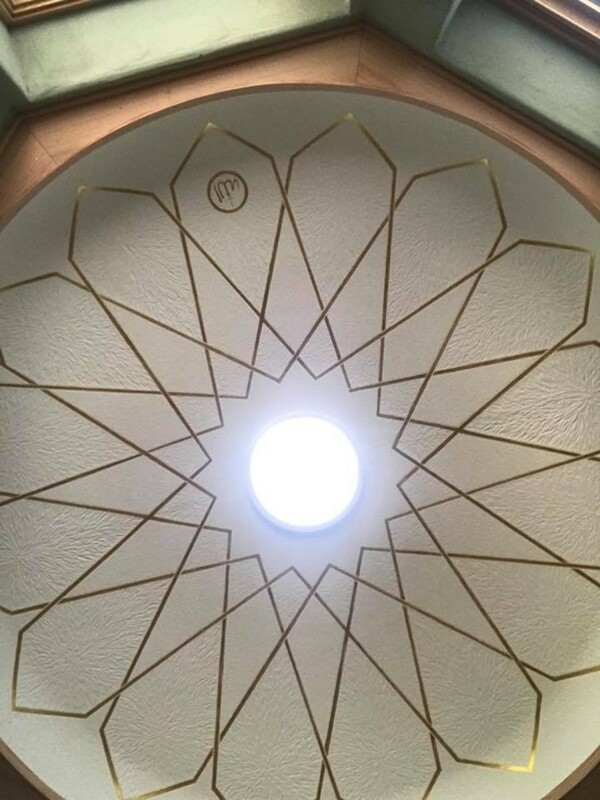 Islamic geometry participates in a universal tradition of sacred geometry. 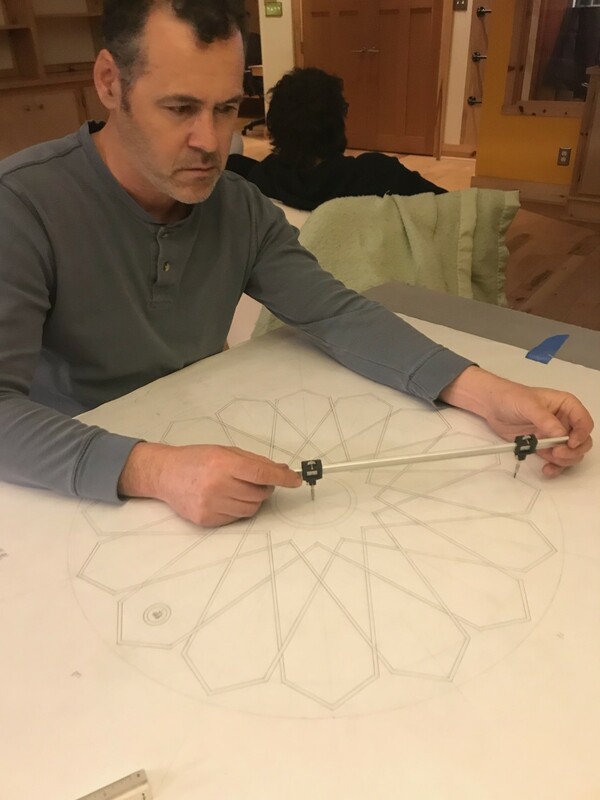 Principles of the sacred feminine in harmonious relation with the sacred masculine were intrinsic characteristics of the tessellated dome that I sought to augment. For example, the "void" of the dome can point to the vault of heaven but has a perhaps stronger correlation with the universal "womb", the unseen and unknown mystery out of which all emerges. Rather than being considered empty or being nothing, the void symbolises that which is as of yet undifferentiated...potential itself. The gentleness and ethereal nature of the void are contrasted with the rigourous order, the imposed and revealed pattern of the tessellation. For the enrichment of the surface we chose to further accentuate these principles of softness/sharpness, darkness/light, the sacred feminine and masculine. The oculus at centre surrounds a lightwell, literally bringing the light of the sun to be the focal point of the design. The tessellation continues to emanate from there in successive waves. The sixteen-pointed star received a soft dimpled pattern representative of the sacred feminine, next contrasted by the sharp "flamed" texture hand gouged with wood chisels. The safts of the tessellation were so proportioned as to provide balance between these soft/hard, feminine/masculine elements. The end result is a harmonious composition that takes disparate, contrasting elements and interlaces them together into its own symbolic "universe", a single turn of the divine compass, encompassing quite literally the sacred feminine and masculine, seen through the symbol of unity, the perimeter of the circle through which it is entered.